Losing even one tooth can be a devastating experience that impacts every aspect of your life from sharing a smile, to speaking clearly and eating all your favorite foods. Finding the right tooth replacement option is essential. At Indigo dental, we can offer a number of restoration options, but we most often recommend implant supported tooth replacement because it provides a number of benefits to improve oral health and function. In order to determine whether or not dental implants are the right treatment option to meet your needs, we’ll need to schedule a tooth replacement consultation to examine your smile and provide recommendations for the best treatment options. When you’re ready to get started, call our Daytona Beach dental office to schedule your tooth replacement consultation with us today. Keep reading to learn more about the many benefits of replacing missing teeth using dental implants. 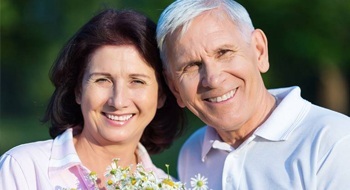 Especially in the case of advanced tooth replacement using partial and full dentures, the use of a dental implant supported prosthetic can help patients to preserve a healthy, youthful appearance. Because they replace the roots of teeth, dental implant posts provide the necessary stimulation to maintain healthy gum tissue volume and jawbone density. This means you’ll avoid the shrunken in or drooping facial appearance that many denture wearers struggle against. 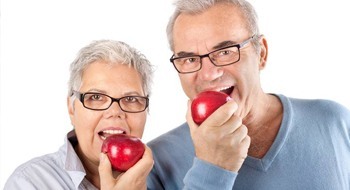 Traditional dentures only restore about 20% of healthy chewing ability, but an implant supported denture can restore 70% or more, allowing you to consume all of your favorite foods without concerns about shifting dentures. Even less extensive tooth replacement solutions like implant supported crowns and bridges offer improved function and stability for a longer period of time compared with traditional crown supported fixed bridges. Oral health is about more than just having a smile you’re proud to share. It’s also about the ability to speak clearly and consume a range of nutrient-rich foods. By replacing teeth from the roots up, dental implant-retained crowns, bridges, and dentures offer a close-to-natural end result that will ensure your smile remains healthy and functional for years to come. Implant supported restorations are fully self-supporting. Because they don’t rely on surrounding teeth and gums for support, these restoration options ensure your remaining teeth, gums, and other oral structures remaining healthy and functional. Because dental implants fix your replacement tooth or teeth in place, you can simply brush them like a healthy smile. This is much simpler than caring for removable prosthetics like partial and full dentures. After 20 years, dental implant supported restorations have a 90 to 95% success rate. In fact, many patients are able to keep their implant supported restoration for the rest of their lives without needing repair or replacement.